Oldman saltbush is one part of the grazing mix. Holistic Management is a philosophy that is perfectly mated to the application of Oldman saltbush grazing: one must work with the true ecological drivers - sun, soil & water. Grazing Management Systems is a pioneer in the application of this methodology with native plants and we can clearly state that,without these protocols, Oldman saltbush is only half the answer. Holistic management thinking is possibly one of the single most revolutionary concepts to impact on land management and rural decision making in the past century. Its underlying philosophy was outlined by the South African Statesman / Philosopher Jan Smuts, in his book Holism and Evolution, published in 1926. In essence, he stated that systems function as a whole, rather than merely as a series of interconnecting subsystems. As a result, one cannot truly understand the entirety of a situation by applying standard systems analysis procedures. This is quite an esoteric philosophy and one that does not seem to readily apply to the real world of land management…until one listens to Allan Savory, who as a young Rhodesian wildlife biologist, was attempting to solve the problem of desertification. By utilising the core philosophies of Jans Smuts, Allan was able to develop a model for land management that completely encompassed the entirety of the system – a model which simply left nothing to chance and offered a new vision of how to quantify achievements. Whilst holistic management’s original application was agricultural, a broader application of its principles is being translated into the wider community – which in turn is creating new ideas and concepts that, in turn, can enhance the business and decision making for sustainable land management. In essence, as used by Grazing Management Systems, holistic management principles represent a biological structure to optimise the use of our natural resources through a questioning & decision making process. It is an approach which demands much, as it measures success not only in terms of bottom line financials, but also in terms of social and environmental well-being. When this thinking is properly applied, these goals are really complementary, not contradictory and are the ultimate measure of the true success in any activity. Your land, your business and your wishes are unique: whilst Oldman saltbush will almost certainly be able to help to some degree to provide a sounder economic and ecological base, ultimately it is your decision making process for “your whole” that provides the true driving force for biological & financial growth. Holistic management is not merely a set of protocols: it is an underlying belief that financial profit, social advancement and environmental sustainability are complementary goals that can be achieved when there is sufficient commitment and knowledge. 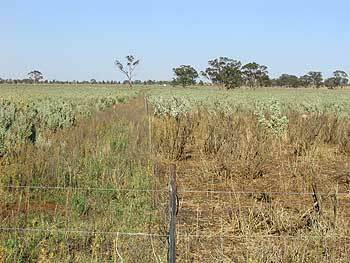 Oldman saltbush, being a fodder crop well suited to rangeland grazing environments, is a key component in making the goals of holistic management achievable. Grazing Management Systems is leading the way in applying Holistic Management principals in its own business as well as assisting landholders in the Australian rural sector.